This weekly review is going to end with a plea. So sit tight. I didn’t do a Doomino Effect last week because Doom DeLuise started reviewing his weekly stash, and not only did he review every comic I bought last week, but I pretty much agreed with him. So in the interest of not making this site redundant, I just decided to ignore the comics I bought. 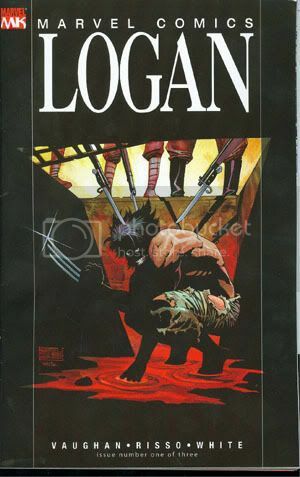 But speaking of Doom DeLuise’s reviews, that leads me to Logan #1, which cost $3.99. I didn’t realize that I spent $3.99 on it until reading his review. As he pointed out to me, the price is hidden on the back. Sneaky bastards. I saw a few unfinished black and white versions of this comic sitting on the shelf beside the one I bought. Maybe Marvel only charged $2.99 for the ones they forgot to finish. Anyway, it’s Wolverine in Japan in World War II. He’s probably going to get nuked. That’s novel, considering we’ve only seen Wolverine survive having his flesh blown off his body about 83 times in the past year. I kind of feel like Brian K Vaughan is like the Neil Gaiman of the ’00s: he’s a multi-media crossover superstar writer, and he writes those comics that the hip non-comics readers are willing to read. Remember how in the ’90s, all the hip kids read Sandman and Neil Gaiman books of poetry or whatever? Ten years later, it’s Y: The Last Man and Lost, baby. Failed analogy aside, I just didn’t feel as much from this book as I would’ve hoped, as is the case with nearly everything I’ve read by Vaughan. Risso’s art was nice, but I was actually more impressed with the watercolors that some people will miss out on. In spite of its stupid price, though, I will probably keep reading it because of my hopes for it. I hope, I hope, I really really hope, that maybe this is supposed to be some kind of spiritual counterpart to the Chris Claremont / Frank Miller miniseries from the early ’80s. That book really helped define the modern Wolverine character, and with the way he appears in series like X-Force and New Avengers, I’m glad there’s something to remind us of the Logan guy behind the mask. Speaking of people behind the mask, that leads me to Green Lantern #28, in which Laira gets her Green Lantern-ness stripped for killing Amon Sur. 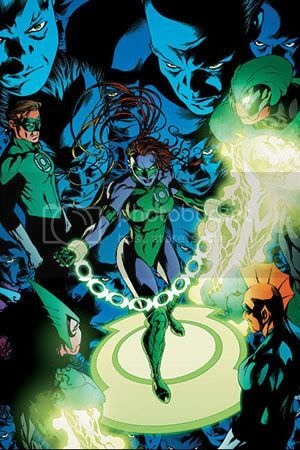 We see more of the creepy Alpha Lanterns, more of the freaked-out Guardians adding more rules to the book, and Laira becoming a raging ball of fury known as a Red Lantern. As next issue takes a break to tell the origin of Hal Jordan, I have a few thoughts and questions about this series. 1. I wonder if Geoff Johns knows what all 10 rules are, and how long ago he thought of them. It took this long to get to the second rule. I wonder if I’ll have children by the time we get to rule 10. 2. 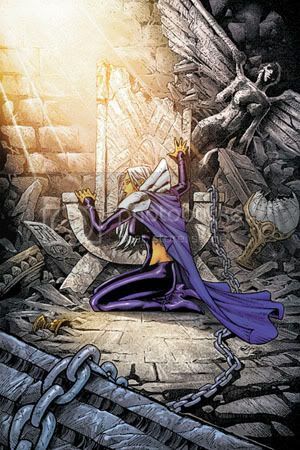 Considering Final Crisis is coming up very shortly, and crises have the tendency to rewrite the past and adjust the course of the present, are we to assume that much of this build-up in Green Lantern is subject to change at a moment’s notice? Or are we to assume on the other hand that the Final Crisis just will conveniently not affect the Green Lanterns? That’s the problem with long-term planning in DC. You get a good idea more than a year early, and they’re likely to expand or compress or destroy or reimagine the universe beneath your feet. I like where this is headed, but I just can’t ignore that looming Final Crisis on the horizon. Speaking of reimagined universes, that leads me to Legion of Super-Heroes #39. It came out a week earlier, but I was so hard pressed to find another book I wanted to read that I decided to un-skip it from last week. I know a lot of people criticized the Mark Waid run, but ever since Jim Shooter took over, I feel like I don’t connect with this series at all. I wonder if that’s because I’m simultaneously reading about a similar yet different Legion of Super-Heroes over in Action Comics — the version of the Legion that Geoff Johns happens to like better, apparently. This issue was little more than a lesson on 31st Century pest control and slang. I have never felt as bombarded by contrived futuristic slang in an issue of LOSH than I did here. Some of this slang might’ve made its way into the book previously, but it was at hit-you-over-the-head levels this month. At least one can rest assured knowing that even in 31st Century comic books, hot girls still just walk around half naked in skimpy 21st-century lingerie. At least Chris Claremont 3000 will be happy. But otherwise, this series has turned into a florgin’ pile of cruk. The Plea: I recently cut myself back to an average of $15 a week at the comic store. Most weeks this means 4 – 5 books (if I don’t count the tax), but lately, I’ve been lucky if even 4 comics come out that I’m interested in. In the past several months, I’ve stopped reading Justice League of America, Justice Society of America, Detective Comics, Batman and Uncanny X-Men, and I’m sure I’ve dropped some others that I’m forgetting. I don’t miss any of them. I really need something new to read so that I don’t lose interest in comics completely. So in the comments here, please recommend some comics that you like every month. Even if it’s not a homerun every issue, it’s at least enough to keep you hooked. I just feel dangerously close to the way I did in the ’90s when I was like “Screw it, I’m done with comics.” And I don’t want that to happen, because then Doom DeLuise would overtake my post totals. I read somewhere that Geoff Johns has Green Lantern plotted out through, like, 50 more issues. I’d recommend picking up Uncanny X-Men again. First of all, Brubaker is awesome, as I’m sure you agree. Second, the art by Mike Choi (who I’ve never heard of before now) is a vast improvement over what Uncanny’s had for a long time. Third, Brubaker finally gets to play around with a real team of X-Men: Cyclops: Emma Frost, Colossus, Nightcrawler, Angel and Wolverine. BTW, I got the B&W Logan, which was so unfinished they didn’t even put ads in it. That was a very nice treat.